How do kids growing up get to be so competitive? I really never understood this. Growing up I wasn’t that competitive. I never wanted to be so rude to someone while playing basketball. I just wanted to have fun. Now in college, in my major, I have grown increasingly competitive. I am in a major where a lot of kids take the work for granted. They don’t realize that how screwed they are, when they get out of the field. Before I didn’t really care what people made for their projects, but now I just get so mad. I am amazed by how people don’t work hard, and how they produce high school quality stuff rather than college material. It honestly motivates e to blow people out of the water. I am a pretty nice person, its just, when I see these people being so lackadaisical, I just have to beat them. I read an article that talks about how kids about the age of 5-6 start increasing their level of competence. Its funny because 3 year old apparently just imagine that they are really good at different tasks. I feel like it does definitely depend on how the parents might raise the child. 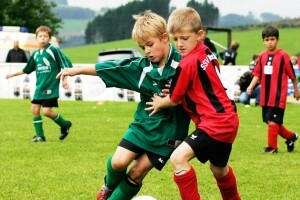 they might encourage these competitive behaviors, or tell them to chill out. Its hard because sometimes we tend to tell them both unknowingly. I know some parents who pushed kids too hard and they just all together didn’t care. Or you have the students who take it, and push themselves to be the best of the best. How do these scenarios differ? Mt parents are that competitive. Hell, they don’t care what I do, as long as I give it my all. My extended family on the other side can get pretty competitive, and I am starting to agree with them. Now talking about it, it really does seem like it depends on each scenario. If I were to do an experiment though, I would track about 6 families. I personally would do families with one child, because siblings can affect kids too. I would want to have 3 of the parents be super competitive. I would pick 3 other parents who are pretty relaxed, and don’t care about that stuff. This obviously would take a long time, but I want to get data, and observations how these kids are raised. And what they are like at the age of lets say 20 years old. The x variable would be the types of parents because that is what we are manipulating. The y variable would be the results talking about whether they were raised to be that way, or they just got it from outside forces. A huge 3rd variable would be the environment. If someone grew up in Silicon Valley, they are going to be insanely competitive, vs someone who is born in Missouri. It all really depends. Also another one is who influences you. This entry was posted in Uncategorized on October 20, 2016 by Reetu Shah. This post was great to read. Growing up I played a lot of sports and was always extremely competitive. I did not like to lose ANYTHING, not even a game of tic tac toe. Now that I have read this post I realize that my family has influenced my competitiveness. I have an older brother who always used to mess around with me, annoy me, and push me. I would get so angry and fight back every time he pushed my buttons because I wanted him to feel the pain and annoyance I did. So, I now know that my brother has influenced my competitiveness. My father also has too. He always pushed me to do my best and even better, and not to lose. Here are signs to see if you are competitive!